Pumpkin is the common name for large-fruited varieties of several species of trailing and climbing plants of the genus Cucurbita, characterized by a round, pulpy, orange or orange-yellow fruit with a thick rind. In particular, it applies to various varieties of Cucurbita pepo, but also can refer to cultivars of C. moschata, C. mixta, and C. maxima. The term pumpkin also refers to the large, edible, globe-shaped fruit, which is a popular vegetable. Cucurbita belongs to the gourd family, Cucurbitaceae, which also includes squash, watermelon, and muskmelon. The pumpkin fruit and flowers, while advancing the plant's own function of reproduction, also provides larger functions for the ecosystem and for humans. Ecologically, the fruit and flowers are a food source for many animals, including bee pollinators that themselves are necessary for fertilization of the pumpkins. For humans, the pulp is used as a table vegetable and in pies and soups, the seeds are popular snacks, and pumpkin seed oil is used for cooking and as a salad dressing. Pumpkin pie is a traditional staple of the Thanksgiving holiday in Canada and the United States and carving of the rind of the hollowed-out fruit into jack-o'-lanterns is a popular activity around Halloween. Pumpkins are members of the genus Cucurbita of the family Cucurbitaceae. Members of the Cucurbitaceae commonly are known as melons, gourds, or cucurbits, and includes crops like cucumbers, squashes (including pumpkins), luffas, melons, and watermelons. The stems are hairy and pentangular, leaves are exstipulate alternate simple, palmately lobed or palmately compound, and tendrils are present at 90° to the leaf petioles at nodes. The flowers are unisexual, with male and female flowers usually on different plants (dioecious), or less common on the same plant (monoecious). The female flowers have inferior ovaries. The fruit is often a kind of berry called a pepo. The term pumpkin commonly applies to particular varieties within the genus Cucurbita, whose members may more generally be known as squash. It is a common name for cultivars of any one of the following species: Cucurbita pepo, Cucurbita mixta, Cucurbita maxima, and Cucurbita moschata. In particular, it is used to apply for the long-trailing species with large, round, orange colored fruit, while the non-trailing, smaller varieties are known as squash. The distinction between squash and pumpkin is not a botanical distinction. Since some squash share the same botanical classifications as pumpkins, the names are frequently used interchangeably. 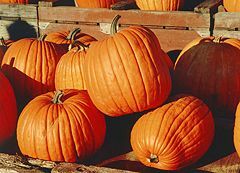 In general, pumpkins have stems which are firmer, more rigid, pricklier, have a +/- 5 degree angle, and are squarer in shape than squash stems, which are generally softer, more rounded, and more flared where joined to the fruit (Considine and Considine 1995; Encyclopedia Americana 1992). The fruit, also known as pumpkins, range in size, shape, color, and appearance (Orzolek et al. 2000). They range in size from less than five pounds to varieties over 40 to 60 pounds (18 to 27 kilograms) (Orzolek et al. 2000). Some get very large: As of 2007, the world record for pumpkins was 1689 pounds (767.7 pounds) (PumpkinNook 2007). Typically, pumpkins are globe-shaped, but may be oblong. The rind may be smooth or ribbed. Pumpkins typically are orange or orange-yellow, although fruits may be dark green, pale green, orange-yellow, white, red and gray (PumpkinNook 2008). Pumpkins are monoecious, having both male and female flowers, the latter distinguished by the small ovary at the base of the petals. These bright and colorful flowers have extremely short life spans, and may only open for as short a time as one day. The word pumpkin originates from the word "pepon," which is Greek for "large melon." The French adapted this word to "pompon," which the English changed to "pompion" and later American colonists changed that to the word we use today, "pumpkin" (PP 2007). Pumpkins originated in the Americas. Stem, seed, and fruit fragments have been recovered and identified from cliff dweller ruins in southwestern United States (Orzolek et al. 2000). Some varieties are believed to have originated in Mexico and Central America, and others in Peru, Ecuador, and Colombia (Orzolek et al. 2000). The oldest evidence, pumpkin-related seeds dating between 7000 and 5500 B.C.E., were found in Mexico (PP 2007). Some varieties may have been cultivated since at least 3500 B.C.E. (Orzolek et al. 2000). Although native to the Western hemisphere, pumpkins are grown all around the world for a variety of reasons ranging from agricultural purposes (animal feed) to commercial and ornamental sales (Wolford and Banks 2008a). Out of the seven continents only Antarctica is unable to produce pumpkins. The biggest international producers of pumpkins include the United States, Mexico, India, and China (PP 2007; WHF 2008). As one of the most popular crops in the United States, 1.5 billion pounds of pumpkins are produced each year (Orzolek et al. 2000). The top pumpkin producing states in the United States include Illinois, Ohio, Pennsylvania, and California (Wolford and Banks 2008). The traditional American pumpkin is the Connecticut Field variety (PP 2007). Pumpkins are a warm weather crop that are usually planted in early July in North America. The specific conditions necessary for growing pumpkins require that soil temperatures at at depth of three inches be at least 60 degrees Fahrenheit, and that the soil be a type that holds water well. Pumpkin crops may suffer if there is a lack of water or due to cold temperatures (in this case, below 65 degrees; frost can be detrimental), and sandy soil or soil with poor water filtration. Pumpkins are, however, rather hardy and even if many leaves and portions of the vine are removed or damaged, the plant can very quickly re-grow secondary vines to replace what was removed (Orzolek et al. 2000). Pumpkins produce both a male and female flowers; honeybees play a significant role in fertilization (Orzolek et al. 2000). Pumpkins have historically been pollinated by the native squash bee Peponapis pruinosa, but this bee has declined, probably due to pesticide sensitivity, and today most commercial plantings are pollinated by honeybees. One hive per acre (4,000 m² per hive) is recommended by the United States of America (U.S.) Department of Agriculture. If there are inadequate bees for pollination, gardeners often have to hand pollinate. Inadequately pollinated pumpkins usually start growing but abort before full development. An opportunistic fungus also is sometimes blamed for abortions. The largest pumpkins are cultivars of Cucurbita maxima. They were cultivated from the Hubbard squash genotype, crossed with kabocha-pumpkin types by enthusiast farmers through intermittent effort since the early 1800s. As such germplasm is commercially provocative, a U.S. legal right was granted for the rounder phenotypes, levying them as constituting a variety, with the appellation "Atlantic Giant." This phenotype has graduated back into the public domain, except now it had the name Atlantic Giant on its record (see USDA PVP # 8500204). “Weigh-off” competitions for giant pumpkins are a popular festival activity. Until 1981, 460 pounds held the world record for the largest pumpkin. At that time, Howard Dill(of Nova Scotia) broke the record with a pumpkin near 500 pounds. Dill patented the seeds used to grow this giant pumpkin, deeming them Dill’s Atlantic Giant seeds, and drawing growers from around the world. Howard Dill is accredited for all of the giant pumpkins today, most of which are borne from crossing and re-crossing his patented seed with other varieties (Raver 2007). By 1994, the Giant Pumpkin crossed the 1000 pound mark. In September 2007, Joe Jutras (of Rhode Island) obtained the title of grower of the world’s largest pumpkin with a 1,689 pound, cream colored fruit (BP 2007). He is currently said to be working on producing a giant orange pumpkin, as orange pumpkins tend to be smaller and have thinner shells, but are more desirable in appearance (Raver 2007). Pumpkin is a rich source of vitamin A, being high in beta-carotene, a precursor to vitamin A. It provides substantial fiber, niacin, and lutein (important antioxidant). Pumpkin seeds have many health benefits, some of which include a good source of protein, zinc, and other vitamins, and are even said to lower cholesterol (WHF 2008). One gram of pumpkin seed protein contains as much tryptophan as a full glass of milk (Whitby 2007). Pumpkins are very versatile in their uses for cooking, from the fleshy shell, to the seeds, to even the flowers; most parts of the pumpkin are edible. The flesh has a mild, sweet flavor and the seeds, when husked and roasted, are "deliciously nutty" (Herbst 2001). Traditionally, pumpkin is a very popular Halloween and Thanksgiving staple. Although most people use store bought canned pumpkin, home-made pumpkin puree can serve the same purpose (Roberts 2006). When ripe, pumpkin flesh can be boiled, baked, steamed, or roasted. Often, it is made into various kinds of pie, which is a traditional staple of the Canadian and American Thanksgiving holiday. Pumpkins that are still small and green may be eaten in the same way as the vegetable marrow/zucchini. Pumpkins can also be eaten mashed or incorporated into soup. In the Middle East, pumpkin is used for sweet dishes; a well-known sweet delicacy is called halawa yaqtin. In South Asian countries like India, pumpkin is cooked with butter, sugar, and spices; this dish is called kadu ka halwa. In Australia, pumpkin is often roasted in conjunction with other vegetables. In Japan, small pumpkins are served in savory dishes, including tempura. In Thailand, small pumpkins are steamed with custard inside and served as a dessert. Pumpkin can be used to flavor both alcoholic and nonalcoholic beverages. Pumpkin seeds, also known as pepitas, are small, flat, green, edible seeds. Most pumpkin seeds are covered by a white husk, although some pumpkin varieties produce seeds without them. Pumpkin seeds are a popular snack that can be found hulled or semi-hulled at grocery stores. Roasting pumpkin seeds (usually scooped out of jack-o-lanterns) is a popular Halloween treat. In Guangxi province, China, the leaves of the pumpkin plant are consumed as a cooked vegetable or in soups. Pumpkin seed oil is a thick, green oil that is produced from roasted pumpkin seeds. When used for cooking or as a salad dressing, pumpkin seed oil is generally mixed with other oils because of its robust flavor (Herbst 2001). It is used in cooking in central and eastern Europe, and, long believed to be a folk remedy for prostate problems, has in fact been shown to combat benign prostatic hyperplasia (WHF 2008). A pumpkin carved into a Jack-o'-lantern for Halloween. 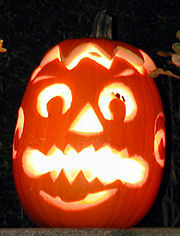 In North America, pumpkins today are commonly carved into decorative lanterns called jack-o'-lanterns for the Halloween season. Throughout Britain and Ireland, there is a long tradition of carving lanterns from vegetables, particularly the turnip, mangelwurzel, or swede. Some trace the name jack-o'-lantern, and its association with carved vegetables and Halloween, to Ireland, Scotland, and Britain centuries ago, with the tradition brought from the British Isles to North America (Wolford and Banks 2008b). Although every modern chronicle of the holiday repeats the claim that vegetable lanterns were a time-honored component of Halloween celebrations in the British Isles, none gives any primary documentation. In fact, none of the major nineteenth-century chronicles of British holidays and folk customs make any mention whatsoever of carved lanterns in connection with Halloween. Neither do any of the standard works of the early twentieth century. Hide it [the great carbuncle] under thy cloak, say'st thou? Why, it will gleam through the holes, and make thee look like a jack-o'-lantern! (Hawthorne, 1837). The old time custom of keeping up Hallowe'en was not forgotten last night by the youngsters of the city. They had their maskings and their merry-makings, and perambulated the streets after dark in a way which was no doubt amusing to themselves. There was a great sacrifice of pumpkins from which to make transparent heads and face, lighted up by the unfailing two inches of tallow candle (Daily News, Kingston, Ontario, November 1, 1866). The earliest reference to associate carved vegetable lanterns with Halloween in Britain is Ruth Edna Kelley in Chapter 8 of the 1919 publication The Book of Hallowe'en, which mentions turnip lanterns in Scotland. In America, the carved pumpkin was first associated with the harvest season in general, long before it became an emblem of Halloween. Articles on Thanksgiving entertaining in the New York Times in 1895 and 1900, recommended a lit jack-o'-lantern as part of the festivities, encouraging kids and families to join together to make their own jack-o-lanterns (NYT 1895, 1900). Pumpkin chucking is a competitive activity in which teams build various mechanical devices designed to throw a pumpkin as far as possible. Catapults, trebuchets, ballistas, and air cannons are the most common mechanisms. Some pumpkin chuckers breed and grow special varieties of pumpkin under specialized conditions in order to improve the pumpkin's chances of surviving a throw. Big Pumpkins (BP 2007). Joe Jutras and his 1689 pound world record! Big Pumpkins.com. Retrieved September 19, 2008. Considine, D. M., and G. D. Considine. 1995. Van Nostrand's Scientific Encyclopedia. New York: Van Nostrand Reinhold. ISBN 0442018649. Encyclopedia Americana International Edition. 1992. Danbury, Connecticut: Grolier Incorporated. ISBN 0717202232. Hawthorne, N. 1837. Twice-told Tales. Boston: American Stationers. Kelley, E. 1919. The Book of Hallowe'en. Boston: Lothrop, Lee & Shepard. Retrieved September 19, 2008. New York Times. 1895. The day we celebrate: Thanksgiving treated gastronomically and socially. New York Times November 24, 1895, p. 27. Retrieved September 19, 2008. New York Times. 1900. Odd ornaments for table. New York Times October 21, 1900, p. 12. Retrieved September 19, 2008. Orzolek, M. D., G. L. Greaser, and J. K. Harper. 2000. Pumpkin production. Agricultural Alternatives. Penn State College of Agricultural Sciences. Retrieved September 19, 2008. Pumpkin Nook. 2007. World record giant pumpkin. PumpkinNook.com. Retrieved September 19, 2008. Pumpkin Nook. 2007. Color me pumpkin. PumpkinNook.com. Retrieved September 19, 2008. Pumpkin Patch (PP). 2007. Welcome to the Pumpkin Patch. Pumpkin-patch.com. Retrieved September 19, 2008. Raver, A. 2007. In the pumpkin patch, an orange thumb. New York Times September 19, 2008, section F, page 6. Roberts, T. 2006. The many uses of pumpkin. Food & Fitness August 7, 2006. Retrieved September 19, 2008. Sage, A. C. 1885. Halloween sports and customs. Harper's Young People October 27, 1885, p. 828. Skal, D. J. 2002. Death Makes a Holiday: A Cultural History of Halloween. New York: Bloomsbury. ISBN 158234230X. Whitby Mental Health Centre. 2007. New study demonstrates treatment of anxiety disorders using pumpkin seed. Whitby Mental Health Centre. Retrieved September 19, 2008. Wolford, R., and D. Banks. 2008a. Pumpkins facts. University of Illinois Extension. Retrieved September 19, 2008. Wolford, R., and D. Banks. 2008b. Pumpkin history. University of Illinois Extension. Retrieved September 19, 2008. World's Healthiest Foods (WHF). 2008. Pumpkin seeds. The George Mateljan Foundation. September 18, 2008. This page was last modified on 22 September 2008, at 12:58.